Row 2: Ch 2, Skip 1￼ St. (2 Dc, Ch 2, Sc) in Ch 2 space. *Skip 3 Sts. (2 Dc, Ch 2, Sc) in Ch 2 space. Repeat from * across. Turn. Row 3-end: repeat 1-2 until one Sc is left. Tie off. Set aside. Row 3: 1 Sc in next 8 St. tie off. Set aside. Row 2-13: 1 Sc in each St. Join each round with a Sl. Sew all parts (ears, eyes, nose, eye patch) onto face before stuffing head. Pinch a corner of the blanket and place the puppy body in the position you want it in. Sew securely in place. 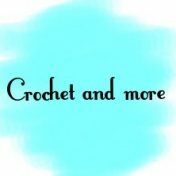 Crochet And More, Create a free website or blog at WordPress.com.